With so many great reality shows back with new episodes this week and others that are filming for the next season, it makes sense that a lot of reality TV stars are sharing behind-the-scenes photos. New York Housewife Tinsley Mortimer finally cut her signature hair, so of course she shared a photo of getting all glammed up with her new look. Real Housewives of Potomac star Monique Samuels shared a photo of her hair and makeup team getting her ready to throw shade during some on-camera interviews this season. Orange County Housewife Shannon Beador also posted a photo of her glam squad in action. Southern Charm star Shep Rose shared a photo of he and Whitney Sudler-Smith in front of a green screen in between shooting some commentary on the current season. Reality Star Instagram Roundup: Kylie Jenner, Andy Cohen, Luann de Lesseps, Arie Luyendyk Jr, Omarosa, & More! This week was a family-oriented week for a lot of your favorite reality TV stars- or at least there were a lot of family photos posted on Instagram. After spending her whole pregnancy away from the media, Kylie Jenner shared a photo holding baby Stormi. Kylie’s older sister Kim Kardashian posted the first photo with her daughter Chicago West. It’s beginning to feel a lot like 2009. I am anticipating the premiere of a new Jersey Shore show and I could not be more excited. Jersey Shore Family Vacation is exactly the kind of escapism that we need these days. The show hasn’t even premiered yet, but the the stars are blowing up social media with the news of a second season. Instagram Roundup: Kyle Richards, Lala Kent, Amber Portwood, Trista Sutter, Snooki, & More! A lot of the reality stars that you love (and love to hate- or at least love to make fun of) were very active on Instagram this week, but don’t worry about refreshing your feed. We have the most interesting photos from the past few days in this week’s edition of Instagram Roundup. Vicki Gunvalson’s ex-husband Donn Gunvalson spent time with Briana Culberson, Ryan Culberson, and their two sons in North Carolina. Randy Houska was also on grandpa duty with his Chelsea Houska’s children. If you have suffered through just one episode of MTV’s Floribama Shore then you realize what an insult it is to every true Jersey Shore fan. The network couldn’t leave well enough alone. You don’t mess with a classic! Thankfully, the less than stellar predecessor of MTV’s greatest accomplishment has stirred up a frenzy surrounding the original gorilla juiceheads and orange meatballs, and we are going to be treated to Jersey Shore Family Vacation. Very soon we won’t have to merely rely on tiny blurbs about Mike “The Situation” Sorrentino’s alleged tax evasion or Vinny Guadagnino’s musings on global warming. We will have the whole gang back together again…with the exception of Sammi “Sweetheart” Giancola. However, Jenni “J-Woww” Farley is crossing her fingers for a change of sweetheart–and so am I! The Jersey Shore cast is reuniting for a brand new reality show. Hopefully it’s better than that random thirty minute special where they drove around and got lunch which aired on E! early this year. This revival is Jersey Shore: Family Vacation. 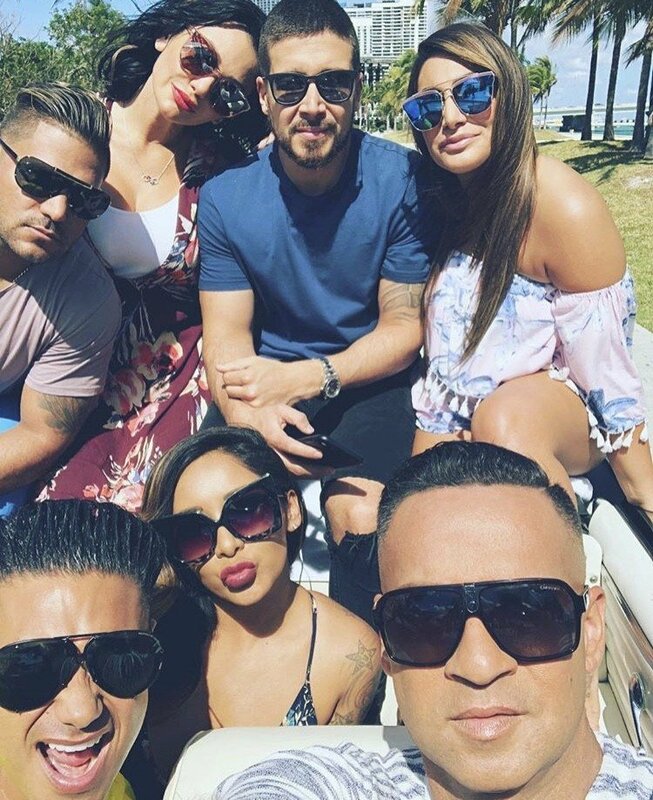 Nicole “Snooki” Polizzi, Jenni “JWoww” Farley, Paul “Pauly D” Delvecchio, Mike “The Situation” Sorrentino, Deena Nicole Cortese, Vinny Guadagnino, and Ronnie Ortiz-Magro will all be back for the vacation. Sammi “Sweetheart” Giancola will be skipping out on the fun, which is probably in her best interest since Ronnie is having a baby with someone else and she has a new relationship of her own. It’s not what’s best for the viewers, but it’s definitely a good move for her personally. Is the Jersey Shore’s Pauly D Network Hopping? Oh, Pauly "DJ Pauly D" Delvecchio…have you been cheating on me? No? Well, you've been cheating on MTV, although I can't say I blame you. You were enticed by the dimples and flashy Kardashian representation that Ryan Seacrest provides. I don't think anyone will judge you. The acronym creating, high hair wearing, "cabs are heeya" screaming star of Jersey Shore is getting a new show…and it's not on the network that made him an international reality star and a household name. That's right. He's potentially moving on to E! What a tangled web we weave when first we practice to hop to another channel for more money. I'm not hating, Pauly…I want you in my TV line-up regardless. DJ Pauly D Making Millions, The Situation Dismisses a Lawsuit; Plus Season 6 Premiere of Jersey Shore Announced! 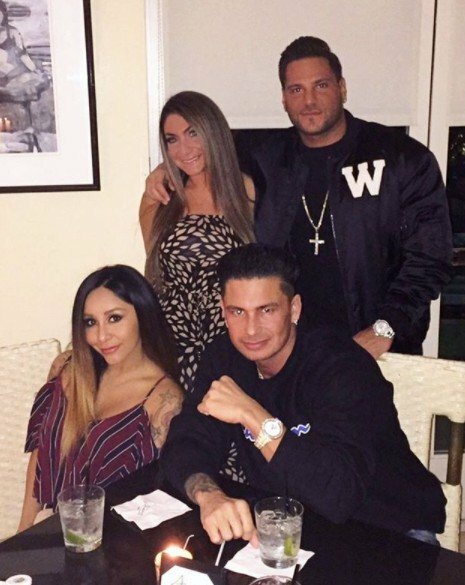 It’s time for an update on those crazy thirty-year-old adults kids from the Jersey Shore! On tap today, we have have a ridiculously rich fist pumper, a very relieved former pill popper, and the announcement of the premiere date for what will likely be the gang’s (or at least Nicole “Snooki” Polizzi’s) final season of the show. Forget GTL, everyone’s favorite future pseudo uncle needs a new catchphrase–GTM2, as in gym, tan, make millions. Forbes just released its list of highest paid deejays, and Pauly D was number 7 in the rankings. The easy-going prankster can clearly spin some turntables as it’s being reported he made $11 million in the last twelve months. Yes, you read that correctly! How does one learn to spin tunes? I could surely be a blogger by day and a deejay by night, right? Who needs sleep? Given that Pauly has his own spin-off, a line of clothing, his name on some tanning lotion, and a set of headphones he markets with 50 Cent, it’s safe to say that Pauly is more than just an orange face a pretty face. He’s a cash cow with gravity defying hair!